The Wed Plan is the ultimate planner with everything the bride needs for her perfect wedding. The portable planner is uniquely designed to help her prepare for the most important day of her life, stress-free. 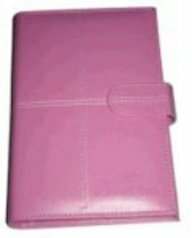 It comes with a detailed twelve month timeline, checklists, and agenda to record important information, including budgeting, addresses, telephone, plus a gift journal to keep track of gifts. If you have any questions about this product by Ana Studio Inc, contact us by completing and submitting the form below. If you are looking for a specif part number, please include it with your message.